There was a thread on the board some time ago about the proposed Over the River art installation on the Arkansas River in Colorado. Everyone was against it. Me too. The environmental impact of covering over a river for miles on end, for a sustained period of time outweighs any possible aesthetic benefit, and if you want to stimulate a debate about man's relationship with the environment you should be able to do it without upsetting that same environment. I felt this was an idea and an artist out of sympathy with the world. 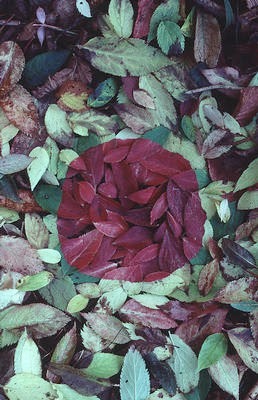 The same cannot be said of Andy Goldsworthy. Andy is a land-art sculptor who has worked in nature since the mid-seventies, and constantly astounds with his creativity and sensitivity; his sympathy with, and understanding of his environment. I went to a talk by the great man himself on Thursday night. Any time you listen to someone who is at the top of his or her game, deeply committed and articulate, you know it's going to be good. And it was. He ran through a spellbinding hour's worth of images of his work, talking about why he does it and his relationship with the work and his environment. And try as I might I couldn't help but see the parallels between what he does and what we do when we head out to the river, fly rod in hand. The point of it all for Goldsworthy is to try and learn about the rocks and stones, leaves and sticks, or the ice and rain that feature in his work. He is looking for connections between materials and their relationship with light and wind and heat. He really takes time to understand colour (he said he knew a lot about yellow and red, but still didn't fully understand green!). All of which does sound a bit esoteric, I agree. But certainly no more so than someone trying to learn about larvae, nymphs, pupa, and emergers; how and why fish react to different light conditions, currents and stream-bed materials; the way a certain dubbing changes colour in the water or a how a particular hackle feather might fit a certain hook; why a bending rod is good for casting; then trying to work out how all of these things are connected. Goldsworthy railed against those who see nature as an inviolable, separate thing from human existence. He sees man as very much part of nature and wants people to see his work as an intervention in the landscape, a sympathetic intervention that makes you appreciate man and nature even more. Fishing puts us right in the middle of the natural world and to succeed we need to make ourselves fit in. We need to connect. When we do, at last, connect we have a deeper understanding of ourselves and the world we're in. Finally, Goldsworthy talked about the often-temporary nature of his work (much of it only lasts a day, or even only a few seconds, or until the weather changes). He may spend days planning a piece of work, only to see it collapse before it's done, or for the wind to get up and blow it away just hours after completion. He talked about the intensity and fragility of this process that both challenges him and reminds him of the transient nature of things. He understands loss in the way we do when, after spending months planning and trying to catch a big fish, we make ourselves let it go. Nothing tangible for our efforts, just joy and a little understanding. Those two words do well for me in summing up why I love fly fishing after all.